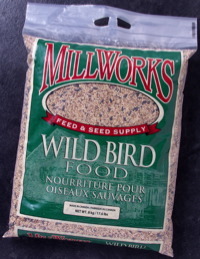 Millworks Brand Wild Bird products are the ideal choice for attracting a full range of wild birds to your feeder. We offer many different formulas and types of products, but no matter which one you have chosen, you will find only the best ingredients, hand selected to attract more of the more desirable birds, such as Blue Jays, Cardinals, Nuthatches, Chickadees, American Goldfinches and Grosbeaks. Black oil sunflower, red milo, peanuts (no shell), white millet.